Fifth-graders Kinzie Smith and Alexis Graham prepare a tuna melt recipe Tuesday afternoon during the United Way of Delaware County’s “Cooking Matters” program at Willis Education Center. Elementary and middle school students, with the help of OWU students learned how to make simple, healthy recipes that they could replicate at home. https://www.delgazette.com/wp-content/uploads/sites/40/2019/03/web1_DSC_0196.jpgFifth-graders Kinzie Smith and Alexis Graham prepare a tuna melt recipe Tuesday afternoon during the United Way of Delaware County’s “Cooking Matters” program at Willis Education Center. 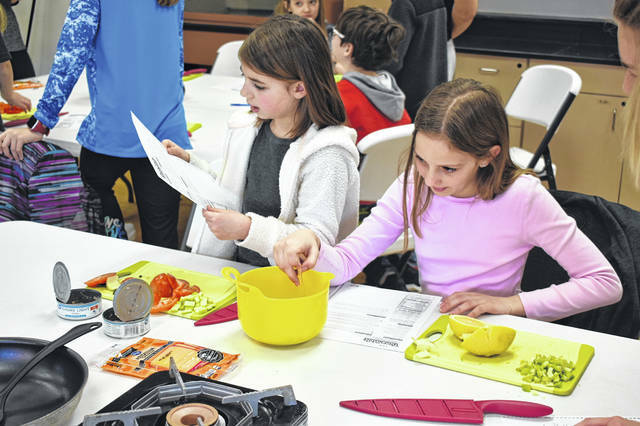 Elementary and middle school students, with the help of OWU students learned how to make simple, healthy recipes that they could replicate at home.